Steve Federspiel tops 409-entry field to win @msptpoker @MeskwakiCasino Main Event for $86,949. Season 10 of the Mid-States Poker Tour (MSPT) continued this past weekend at Meskwaki Casino in Tama, Iowa. The $1,100 buy-in tournament attracted 409 entries over a pair of starting flights. On Sunday, 47-year-old credit union lender Steve Federspiel finished as the last player standing to win an $86,949 first-place prize. Prior to the win, Federspiel had $171,393 in lifetime earnings including a prior best of $57,010 for finishing 114th in last year’s World Series of Poker Main Event. He also won $49,927 for finishing runner-up to Yoon Kim in last year’s Chicago Poker Classic Event #1: $360 NLH. According to updates from the event, Day 2 saw 59 players return to action, but with 45 slated to get paid more than a dozen would leave empty handed including reigning MSPT and HPT Player of the Year Aaron Johnson, MSPT champ Rob Wazwaz, and bubble boy Chad Willett. 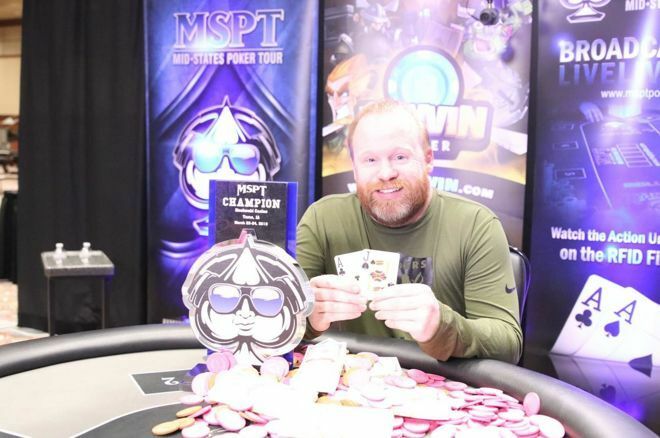 Players to cash the tournament but fall short of the final table included MSPT Majestic Star champ Mike Shin (12th - $6,324), Day 1a chip leader Jason Bender (18th - $4,348), three-time MSPT champ Blake Bohn (23rd - $3,201), HPT Black Hawk champ Nick Pupillo (30th - $2,371), former champ Keith Heine (35th - $2,371), and Tim Garles (43rd - $2,174). The MSPT Meskwaki final table. At the final table, Stephen Lewis was the first to fall after his pocket queens were cracked by Jordan Miller’s ace-queen thanks to an ace on the flop. Not long after, Day 1b chip leader Shane Battani followed him out the door in ninth place for $7,509. Miller bowed out in eighth place losing queens to Tom Stambaugh’s Big Slick, and then Nghia “3-Putts” Le fell when his king-queen suited failed to win a flip against Joe Walters’ pocket sevens. Mike Rieck also lost with king-queen failing to get there against Stambaugh’s pocket eights to bust in sixth place for $16,600. 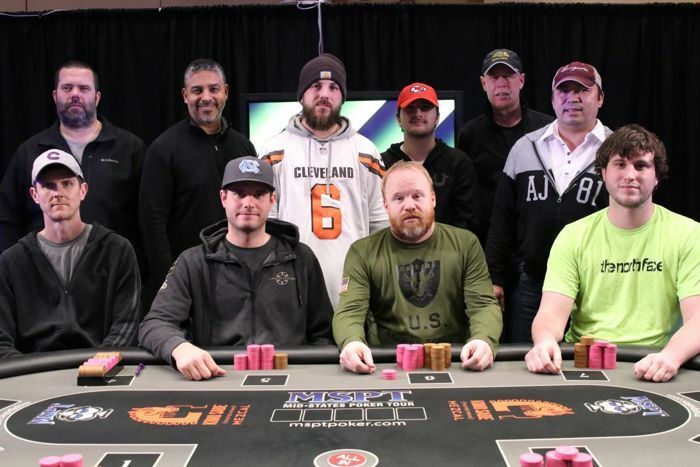 After Chip Leader Coaching’s Brad Sailor took his leave in fifth place, Stambaugh got his stack in after flopping middle pair of jacks only to discover Walters had flopped top pair of kings. Stambaugh failed to get lucky and departed in fourth place for $28,852. The short-stacked Scott Vetter was then felled in third place by Federspiel, which set up a heads-up match with Federspiel holding a more than 4-1 chip lead over Walters. In the final hand of the tournament, Walters got it in with ace-four suited and was dominated by Federspiel’s ace-jack. The superior ace held and Walters had to settle for second place and a $53,751 consolation prize. Season 10 of the MSPT continues in early April with a $1,100 Main Event at Milwaukee’s Potawatomi Hotel & Casino April 4-7, and a $350 Regional Event at Colorado’s Golden Gates Casino from April 3-7.